Shuffle? You know the movement – dragging feet, stumbling back and forth between two sides. Changing our body weight from one leg to another, moving only slightly when feeling awkward, embarrassed or uncertain. Or to intermix like the cards in a deck or shuffling papers on our desks into a different order. The movement between 2018 into 2019 shuffled in my spirit this year. I normally love this time of year and relish the fresh new year just waiting to emerge. But this year I found myself vacillating back and forth in my annual reflection of the old year and the yearly planning for the new year. But now as 2019 is birthed and time moves on, I am realizing the lessons I learned while doing this wavering spiritual shuffle. I needed the time bouncing back and forth to gain a new perspective about how I was feeling and recalling the past 12 months. And my opinion about 2018 did change during this spiritual shuffle. Guess an occasional swing between old and new brings transformation – never really noticed or acknowledged this before in my spiritual journey. When reflecting about last year, I discovered in my soul and named my emotions: the shroud of shame and a growing sense of failure. This is hard to admit for this number three on the Enneagram who likes to project an optimistic image and easily stuffs my emotions deep into my gut. You see in the second half of the last year I tried something new but found it life-draining and spirit-depleting. I detoured off the path onto a new adventure that didn’t quite work as well I anticipated. Did this activity draw me closer to God? At first glance no. What finally helped me let go of 2018? Instead of shillyshallying back and forth, clinging to regret and self-pity, I decided to reorganize my office. Looking back, I think my clean up, take charge, redo effort was an action to retake control over my time, space, and life. I threw out – literally – the old. I boxed up the remnants of my failed project and got it out of sight. The physical act of renewing my surroundings brought energy into my spirit. I shuffled again but this time by ordering my environment, my calendar, and my attitude. As I pitched, shredded, and recycled, I talked with God. Working most of the time in silence, lessons about last year bubbled up and brought forth gifts to unwrap. If you have followed this blog for a while you know I keep a journal. A spiritual practice I do every year is to reread the old years’ journal entries – yes from January through December – noting patterns and paying attention to God’s touch that often is missed during the moment, yet always there. During my massive clean-up, I felt God inviting me to slow down and do my yearly review of my journal. In the messy office, I obeyed and found peace. I rediscovered blessings throughout 2018 that hid under the chaos of my misadventure in the second half of the year. I totally forgot deep lessons I learned while on retreat. The joy experienced with friends while traveling. Moments I heard God in the mundane and everyday encounters. 2018 burst with goodness and wisdom. For example, I realized the decision to try this new adventure arose from a place of inadequacy – quite an insight considering my word of the year for 2018 was “enough.” An amazing lesson for me for future discernment: ask myself if I am making a choice out of self-doubt and feeling not feeling good enough. Are my ego and lack of confidence driving this decision? The review opened my eyes to what I did finish in 2018 and reminded me of many times where God affirmed my call of ministry and writing. Sacred work that does bring me closer to God. Another insight emerged when considering the major house renovation my hubby and I undertook this year – remodeling the inside of the front of the house and updating the outside backyard deck and fence. Things were so chaotic, almost disorienting during the process but we love the end results. The process, though messy, launched a valuable step in transformation. What I thought was a detour, a failure, a misadventure the second half of 2018 also proved to be a messy process that led me into transformation. I too endured an inside remodeling of my heart with lessons learned that brought me back in realignment with God. 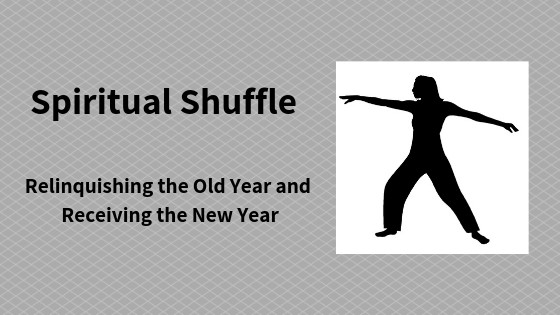 Shuffling allowed me time to reflect on what I learned and experienced in the past year and momentum to renew and relaunch into the new year. This spiritual shuffle evolved into a slow, loving dance with God. God leading. Me following. A good dance. I am giving myself grace – I am not a failure,.I am a child of God and a work in progress. God is good to forgive, sooth my embarrassed and wounded ego, and gently invite me onwards, dancing with him into his grand new adventure called 2019. Have you ever shuffled spiritually? What did you learn from 2018?